Dr. Orkaby gave a comprehensive talk on how historical and societal factors led to the current civil war in Yemen, arguing that the intervention of geopolitics has prolonged it. A key example he gave of this lay in the 1962 military coup of Imam Muhammad al-Badr, a Zaydi Muslim. Though this is same sect of Shia Islam of today’s Houthi movement which Saudi Arabia is fighting against, Riyadh had backed him due to monarchical solidarity, along with Jordan and the United Kingdom. The rebels, who were eventually victorious in founding the Yemen Arab Republic, were then heavily supported by Egypt. Dr. Orkaby also stressed the historical and cultural differences within a united Yemen. The country, which united in 1990, had for centuries been separated by the Ottoman occupation of the north-west and Saudi Arabia’s influence in the south-east. Indeed, the current borders of the conflict resemble the previous borders with Houthi rebels occupying much of the north, while the government holds more control in the south. Dr. Orkaby concluded with a discussion of the decline in influence of the Yemeni intellectuals who first created the united Yemen republic. The next generation is now at the helm—a group which Dr. Orkaby argued does not have the same forward thinking as the founding group. Indeed, Mansour Hadi, the acting president of Yemen, is currently living in a five-star hotel in Riyadh, Saudi Arabia, while thousands in his country face near starvation. All of these historical and societal factors, Dr. Orkaby argued, are often overlooked due to the international media’s focus on the Saudi Arabia—Iran proxy war. 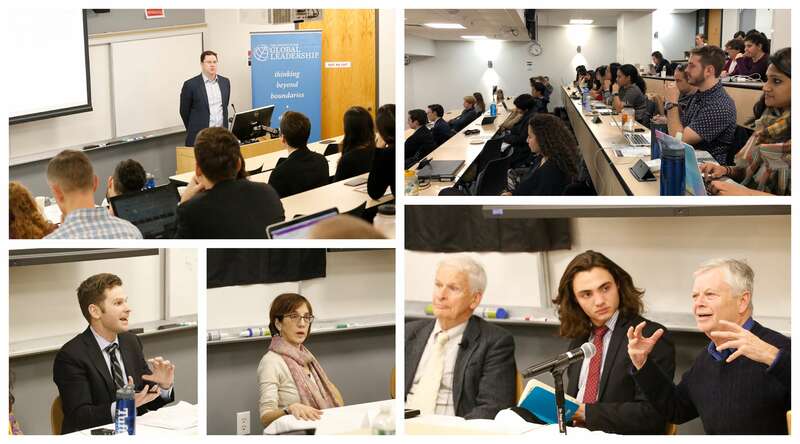 That being said, the tensions between Saudi Arabia and Iran cannot be overlooked and took center stage in the first panel on the geopolitical complexities surrounding the conflict. Former Ambassador Charles Dunbar began the discussion by addressing Saudi Arabia’s role and implacability. He contended that Crown Prince Mohammed bin Salman’s nationalization of different economic agencies in Saudi Arabia demonstrates his complete authority because he has, in a sense, dismantled the previous oligarchical system. This has cemented Saudi Arabia’s national interest in regional hegemony and, by extension, the containment of the rise of Iran. This larger tension between Riyadh and Tehran has manifested itself as several proxy conflicts throughout the Middle East and is one of the largest reasons that the Yemen War has been dragged out into what is being called the worst humanitarian crisis in the world. Following this, Stephen Kinzer made several points regarding the role of the U.S. in Yemen, and how weapons sales have become a cornerstone of U.S. foreign policy. It is unlikely that Washington will place an embargo on Saudi Arabia, regardless of humanitarian violations or the murder of Journalist Jamal Khashoggi. Finally, Mr. Kinzer pointed out that the Houthi rebels were not originally an Iranian proxy, but rather it was the war’s escalation and Saudi involvement which led to Iran becoming more involved. The conflict’s escalation led to the second panel discussion centered around the current humanitarian crisis which now confronts Yemeni citizens daily. Sara Torres, NIMEP member and the moderator of this session, opened the panel by delving into numerical figures which highlighted the severity of the situation. Ten million people, or 44 percent of Yemen’s population, are undernourished; an estimated two million children have acute malnutrition; over one million Yemeni are estimated to have cholera; 90 percent of internally displaced people lack access to basic human needs. Ms. Sirkin then spoke about a key reason behind the conflict’s severity: the targeting of health professionals and facilities throughout the country. She works with Physicians for Human Rights, an organization which has been documenting attacks against health services in conflict-prone regions (a direct violation of the Geneva Convention and international norms). Initially, the attacks were likely because of imprecise targeting equipment, and weapons were used indiscriminately. As technology has gotten better on both sides, these inhumane attacks have decreased, though she said this could also be due to many major targets having already been hit. More than half of Yemen’s health facilities are non-functioning, and a majority of the country’s population lacks access to healthcare. The 23 attacks on hospitals which Ms. Sirkin’s organization recorded in the past year have had compounding effects on Yemen’s crisis—disproportionately impacting the sick and elderly, spreading terror among the population, and eroding measures in place to prevent the spread of infectious diseases such as cholera. The solution, argued Ms. Sirkin, lies in holding the belligerents accountable by a proliferation of information, embargos, and eventually through international courts. Captain Micciche rounded out the discussion with his on-the-ground experience by talking about the Saudi-led blockade that has crippled the Yemeni economy and exacerbated the nation’s widespread famine. He talked about his team’s founding of the Maritime Combined Coordination Cell, a group which helped get both commercial and humanitarian aid vessels into the ports. Here the Captain highlighted the importance of the free exchange of goods, as humanitarian aid only contributes ten percent of the total needed food. Additionally, he discussed the system’s lack of efficiency, with supplies sitting on boats outside ports for days and getting lost. Even after arriving on land, goods are passed to local truckers to distribute—a low-cost solution which results, however, in losses to belligerents and corruption. To measure his success (or lack thereof), Captain Micciche would track Yemeni food prices and accessibility. He emphasized the importance of rebuilding economic stability as part of a long-term solution to the crisis. NIMEP extended its appreciation to its speakers and audience as well as to its co-sponsors, Amnesty International and Tufts Hemispheres. Complete recordings of the speakers are available on NIMEP’s Facebook page, as well as more information on NIMEP and its members who made everything possible.